On Monday, January 14th, 35,000 teachers with United Teachers of Los Angeles (UTLA)—the second largest teacher union local in the country—walked out for the first time in thirty years. Unlike last year’s revolt against low wages and declining healthcare—normal bread and butter issues for unions—Los Angeles teachers have foregrounded community-centered issues: charter expansion, privatization, and class sizes, all of which deny their majority non-white students the educations to which they are entitled. Through centering community and students, UTLA follows the “bargaining for the common good” playbook pioneered by union locals like the Chicago Teachers Union (CTU), Seattle Education Association, and the St. Paul Federation of Teachers. And unlike last year’s revolt, they’re doing it in one of the bluest of “blue” states, launching a war against Los Angeles Unified School District’s (LAUSD) former hedge fund manager-turned-Superintendent, Austin Beutner: a mirror of CTU’s fight against Rahm Emanuel and his austerity regime. The teacher rebellion has been a long time coming, built over the course of more than a decade through rank-and-file reform movements and pushes for unions to more aggressively advocate for their members and their communities. It should hardly be a surprise: for decades, education “reform” pushed by billionaires like Mark Zuckerberg and supported by neoliberal Democrats has vilified public school teachers, blaming them for the failures in decaying public school systems. Now, the strike in Los Angeles has pushed the fight against neoliberalism’s assault on public education its furthest yet, bringing a massive union local into a direct confrontation with neoliberalism and capital’s insistent drive to vulture off of the remains of public goods. At this critical juncture in the war for public education, DSA Los Angeles is doing exactly what it should be doing: working in coalition with other groups on the socialist left to materially support striking teachers. Moreover, they’re doing it in one of the best ways possible—providing food and nourishment for struggle. The “Tacos for Teachers” initiative, launched by DSA Los Angeles and Los Angeles ISO, has paid street vendors and food trucks in the Los Angeles informal economy to feed picketing teachers. It’s been a monumental success: as of this writing, the initiative has raised over $39,000 dollars, far exceeding the initial goal of $1,000 and garnering nationwide media attention in the process. Like the outpouring of pizzas for West Virginia teachers, “Tacos for Teachers” helps sustain morale on the pickets, relieves the logistical stress in running a massive strike, and frees up strike funds for other use. In addition, DSA Los Angeles has mobilized over 500 shifts for strike support, reinforcing UTLA pickets and demonstrating solidarity through action. Through phone banks, text reminders, and continual organizing, DSA Los Angeles has built a well-run machine to support the strike. 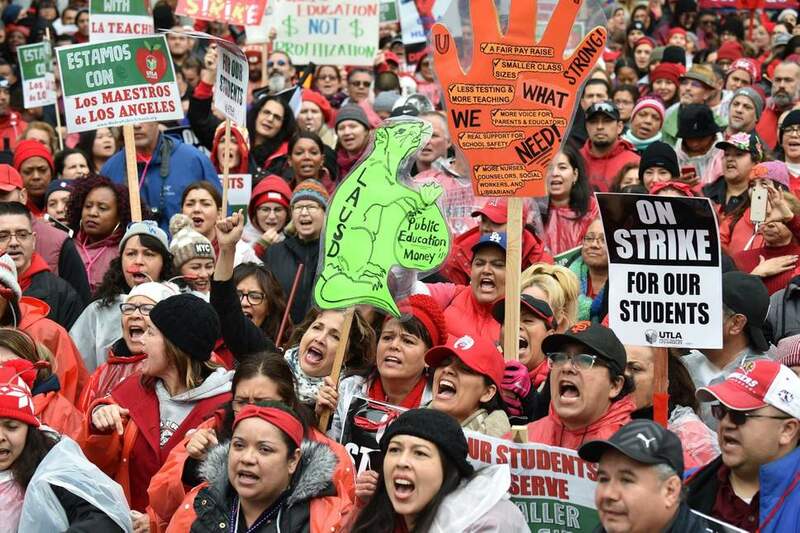 Many of the participants have no direct connection to LAUSD, or to unions: but as socialists, they see the fight for union rights and the fight for public education as one of the critical frontiers for working class struggle. There’s a reason support is important. Striking is hard. In the back of your head, there’s always the voice of doubt: what if it doesn’t work? After time, more doubt can enter: how long can I do this before the bills pile up? What keeps workers going is simple: support. Seeing that support—especially when you don’t feel it in your day to day work—can be powerful. Members of DSA Los Angeles have shared emotional stories of the impact their solidarity has had, and the #UTLAStrong hashtag has been filled with stories about students, parents, and even some administrators demonstrating that they’re with the teachers out on the line. Through their work, DSA Los Angeles is demonstrating the ways in which strike support is one of the most crucial activities the socialist Left can undertake. Although some argue it has limited political utility—after all, we can’t control the course of a strike—strike support builds trust, demonstrates unconditional solidarity, and helps prolong and support difficult confrontations between workers and the boss. The raucous, joyous atmosphere of the UTLA strike—a far from typical occurrence when workers are forced to withhold their labor—is due in no small part to overwhelming community support, much (but not all) of it coordinated through the Los Angeles socialist Left. And the numbers show that it’s working: each day of the first week of the strike, student attendance declined. Doing this means relinquishing some control: a difficult ask for many given the powerful desire to shape and direct every aspect of our political work. When we come into meaningful contact with organic communities we cannot reasonably expect to control the process or outcomes, unless we also have a dangerous expectation of controlling the communities. But what we can expect is to build common purpose: a far more necessary task for the purpose of advancing socialism. DSA Los Angeles is showing what we can build through their actions: as a teacher on the line said, “None of us are going to forget that when it came to solidarity on the picket line, the socialists were here—every day, rain or shine, with songs and tacos for everyone.” We should remember that: for teachers in Los Angeles, they will never forget that—in their moment of struggle, one with far-reaching political consequences—the socialists were there. C.M. Lewis is a member of Centre County DSA, a contributor to Build DSA, and a member of the Strikewave editorial collective.